One question we’ve received from our Facebook Page is “How do we decide where to go next?”. Much of what we’re doing out here is figuring things out as we go. We look at weather, available anchorage options for the forecast conditions, and then take into consideration our needs. Do we need food, fuel, water? Then we consult our guide books (we use Waterway Guide, Explorer Charts, and Active Captain) and figure out where to go next. Leaving Allen’s Cay after a couple of days off the grid with no wi-fi and no services, we weren’t out of water yet, but I’m nervous about running low. We hadn’t filled our onboard water tanks since February 7th. That’s approaching 2 weeks! So we were looking forward to obtaining RO (Water purified by Reverse Osmosis) water at our second brief stop in the Exumas before continuing on… Highborne Cay Marina. I guess my expectations are undergoing major adjustment in that what I expected to see at Highborne was greatly overinflated. The tiny marina was just a blip. We pulled up to the fuel dock and tossed our lines to the attendant. We needed to top off our water tanks with their $.50 per gallon RO water, fill our gasoline tanks for the dinghy and top off our diesel tank and jerry cans. The attendant got a little high-and-mighty when we told him we had a very slow-fill tank, actually told us that if a big boat came in we would have to move and let them in… But none did so he got a little bit nicer as it came closer to tipping time… That attitude and the fact that the supposedly RO water tested out at 408 ppm… I would say we probably won’t go back there. Conditions weren't very good for sailing with light winds and flat seas. We didn’t bother with putting up sails because what wind there was came from the south… Our entire day’s travel was only about 24 miles and took us less than five hours. The anchorage at Hawksbill was gorgeous… so what else is new? 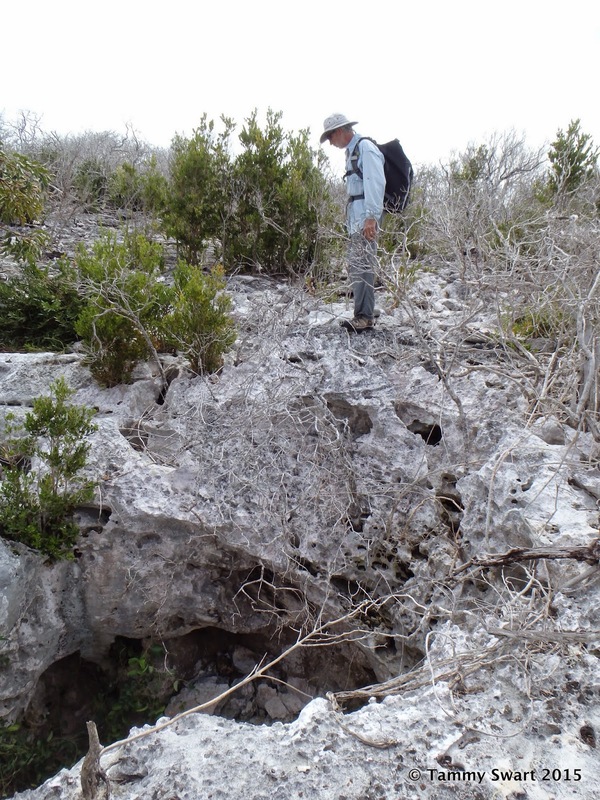 We hadn’t realized that it was part of the Exuma Cays Land & Sea Park until after we arrived. There are four very well maintained mooring balls here with mention of paying at an honor-system box somewhere ashore. We figured we would just as soon anchor, since we were only stopping one night to wait for a shot at a mooring ball at Warderick Wells… but after motoring around the basin we found the best (most adequate) depths to be right around the northernmost mooring ball. So we just picked it up and settled in by mid afternoon. We dinghied ashore to see if we could find the pay station but didn’t. Hmmm… We walked around in the scrubby brush but found nothing much of interest, then did a little bit of climbing on the rocky shore along the northern perimeter. We cooled off in the crystal waters. It was a tranquil anchorage but not much for entertainment. The next morning, we connected with Exuma Park via VHF on channel 9. They monitor all day but at 9 am they assign mooring balls. We were lucky! A mooring ball is available for us at Warderick Wells without having to wait an extra day! Woo hoo! Let’s get going! The wind was a little more brisk and on. the. nose. So no sailing for us. We slogged the fifteen miles into the wind with about every fifth wave trying to dislodge our anchors, bringing water sloshing along our deck so that the scupper drains couldn’t even keep up. Not a fun way to go but the reward was worth it… secure mooring at the beautiful Warderick Wells Park. 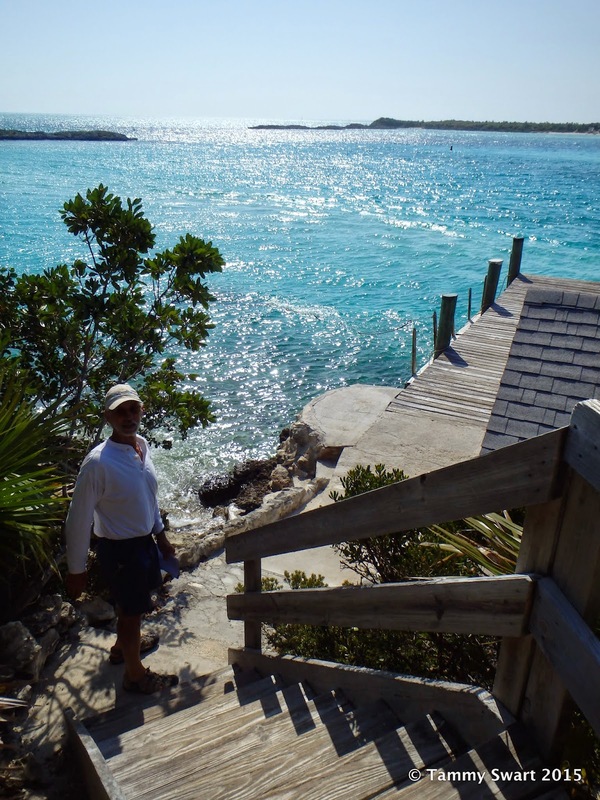 Warderick Wells is the crown jewel of the Exuma Land and Sea Park. It is a part of the Bahamas National Trust, which by the way provides discounts for it’s members… The park is a no-take zone. You may enjoy nature leaving nothing but footprints - taking nothing but memories… We picked our way in around and between the other boats already moored there and picked up our assigned ball, #18 in the western mooring field. The current was swift and the field was open to the strong south winds, but the water was flat. 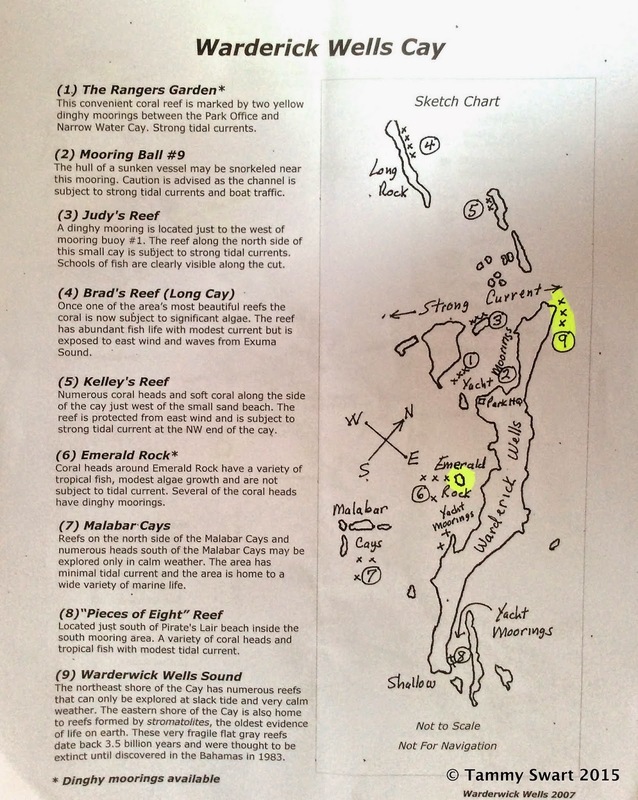 We spent four nights at Warderick Wells, plus the one at Hawksbill (which is also an Exuma park facility) and only paid for three because of the two-free nights included in our BNT membership. This paid for our membership plus some so there is no reason NOT to become a member! If you join, be sure to tell them that you are a “sponsoring vessel” when you request a mooring. 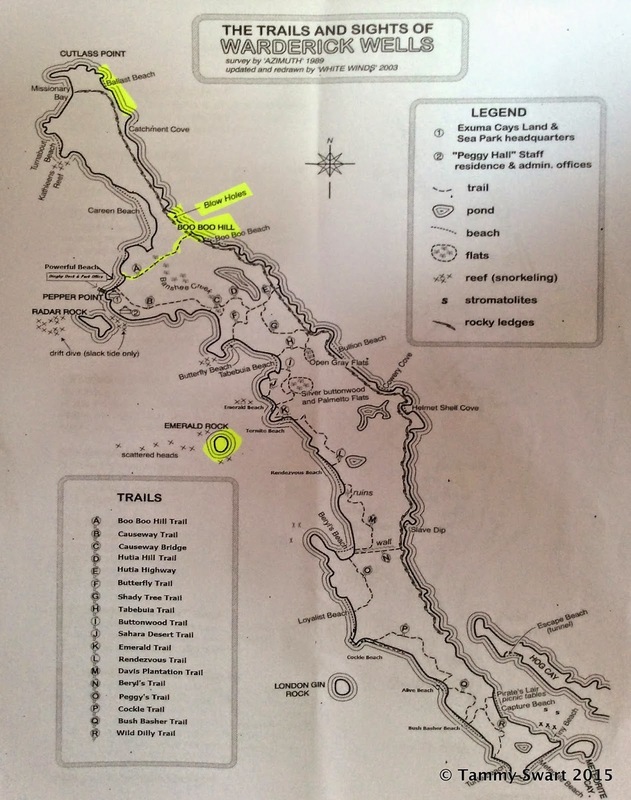 There are handouts provided by the park that highlight all of the hiking trails, beaches and snorkel spots. We could have easily spent more time here, but we did the hikes and snorkeling spots that most interested us. There is a beach adjacent to the Ranger Station where the park hosts a weekly happy hour. One of the cruisers was hosting one on Thursday night and after some cursory exploration on our own, we dinghied over to meet our neighbors. Day two: Off to explore in the dinghy. We had our route mapped out and took off across the banks where it was so shallow in some spots, we had to raise the outboard to squeeze through. Our destination... Pirate's Lair. Bruce had to stand up to get a better angle on the water so that he could avoid the shallows and rocks. A lot of people ride standing up in their dinghies and I understand this to be a "Bahamas thing". I'm not sure of the reason they do it. Some people stand in their dinghies the whole time. Maybe they're trying not to get wet on long treks... Whatever the reason, we see no sense in standing other than to see better for brief periods as needed. But doesn't Bruce look cool? We rounded the tip of the island and beached the dinghy on a tiny sand beach. We were the only ones there. We donned our snorkels and fins and took off to explore the nearby reef in search of the rare Stromatolite reefs said to be found here. I'm not sure that we found them... really didn't know what to look for. But we did find a lot of fish and superb visibility revealing this fascinating underwater world. This fish thought he was hiding from us. We climbed around on the rocky shelf over the reef while we dripped dry and warmed up after snorkeling. The water is still a little cool. Next stop on our agenda was Beryl's Beach. We dinghied back around the tip of the island and tucked into this hidden cove, again all ours! The attraction here is a trail, well... two trails. One that leads to the Davis ruins. We found the hiking trail and started up the rocky jagged and steep slope. The trail split off to the left for the ruins, and continued on along a stacked rock wall to the beach on the other side of the island. We took the pathway to the left which lead us over rocks and around sinkholes... These "Davis" people must have been some hardy souls to have lived up here. Someone still does!!! I was deceived! I thought there were no snakes on the islands!!! We spread our blanket and had a little picnic up there in the quiet breeze. There was no sound but the wind, the birds and the rustling of the lizards (and snakes?). So nice. After lunch we backtracked to the wall trail and followed it to the other side of the island. The view was stunning but the beach was uninviting. We had a great beach waiting for us back at the dinghy! We were SOOOO hot and sweaty and the water felt SOOOO good! This is the life! We cooled our bodies and hopped back on the dinghy... off to the next stop! We wanted to check out the second of two reefs with stromatolites. It is on the far other end of the island and on the wild "sound" side. We popped out briefly and saw that it was impossible for us to consider stopping there with the high winds and huge waves. So we tucked back onto the lee side where we found another private and perfect beach. Then some strange regression into childhood took over my brain and I rolled in the softest white sand I'd ever encountered in my life. I wanted to be a white donut! It was just so joyous! I know! What's happened to me??? I made Sand Angels while most of the rest of the world was making SNOW Angels!!! Time to head back to the boat. This day is done. I'd say we had enjoyed it fully. Day three: I spent some time in the morning whittling. Yes. Whittling. There is a hill here on the island that is the only place that it is pemissable to leave anything but tracks. Cruisers are encouraged to leave their mark on Boo-Boo Hill by way of some sort of driftwood offering with their boat's name on it. I used a sharpie to write our name, then carved it out to last forever. Then I filled it in with sharpie again. I think it turned out pretty good and I didn't even lose a finger. We went ashore to the tiki beach and found the start of the trail to Boo-Boo Hill. It was quite a hike up and down jagged rock pathways that were sometimes unclear. We crossed a creek, not much water going but coming back we had to forge the stream. At last we began to climb to the hill on the other side of the creek. We could see the collection of driftwood pieces left by countless other Cruisers before us. This is another rite of passage for us and we are taking it seriously. It took me quite some time to find just the right spot to display my offering so that it didn't become lost in the rubble. We spent some time up there alone with the view. It really is spectacular. We were in no hurry to leave. The only other thing on our agenda today is to come back up here to take the pathway to the blow holes... but that was much later. There is a memorial bench there. It's nice to think of it there with that view... for all time. Now a little piece of us will always be a part of this place. Tomorrow we will leave here and continue on. But we could have stayed longer enjoying this park and all it has to offer. As members of the Bahamas National Trust... we WILL be back to enjoy this Jewel. Love reading the blog, first time commentor. So 50 cents a gallon for borderline brackish/fresh water. I can see why you you wouldn't buy again. I'm looking at catamarans myself , even though I'm a longtime monohull sailor, and first stop I expect would be in the Bahamas. I'll look to avoid the noted marina's water. Doug thanks for reading and for your comments. There are so many gorgeous places and friendly people here. You may want to pick up an Inexpensive water tester if you don't have a water maker on your boat. We don't mind paying for good water and $.50 per gallon has been the highest so far. I just wish we had tested it before we bought so much of it. Thankfully that has norm been the norm. Glad to have you aboard! We can't wait to get there. We are leaving at the end of this month and will be heading North up the east cost for the summer. We will be in the Bahamas in Novemberish. We bookmarked this so we make sure we get to these places. Hope you continue to have fun! Thanks you guys! I can't wait to read your posts about your adventures too. I love your humor. Now get off the internet and get that boat ready to go!